To learn about the very unique sweeping machine called the Citymaster 300, I spoke with Steve Matthews, of Alpha Plus, located in West Lothian (near Edinburgh). The Citymaster 300 is one of three models made by Hako, a German company located in Hamburg. The Citymaster was designed to compete in the class between the 4-ton sweepers such as the Schmidt, and the walk-behind sweepers like the Green Machine. One of the key selling features of the Citymaster 300 is operator comfort. The cab is air conditioned, the seat is on springs, and there is good all-around visibility. 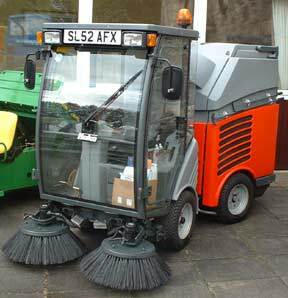 The sweeping width is 1.8 meters with the twin brushes extended, and all material goes through the sweeper's fan. 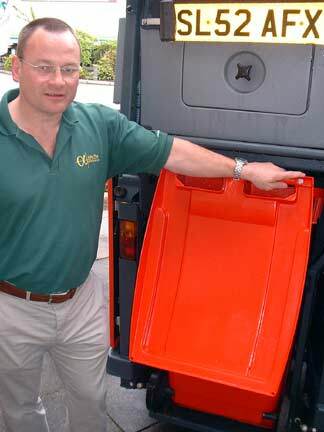 The key design feature that makes this machine unique, however, is its hopper: All material is deposited into a standard 240 liter wheelie bin. Use of a standard, wheeled, trash container allows the councils that use the Hako Citymaster to coordinate their routes in one of two ways. One is to have empty wheelie bins located along the route. Then, when the container in the sweeper gets full, the operator simply swaps it out for an empty one at a nearby location. Alternatively, when a bin starts getting full, the operator contacts (via radio or pre-planned scheduling) the nearest garbage truck driver, and the Citymaster's bin is emptied into the truck. Either way, operators no doubt enjoy working with the machine because no unloading has to be done by hand, thus no lifting is required. When the bin needs changed out, the flip of a switch drops the platform under the wheelie bin to the ground. The operator then wheels the full bin out, and wheels an empty one in. "This is appreciated by the councils from a health and safety aspect," said Steve. "Plus, there is no expensive steel hopper to maintain, and no time wasted in traveling to tip sites. The beauty of the machine is the use of standard wheelie bins, which all the councils use. "Capacity is never seen as a problem, because the users can just work it out so that they have empty bins located wherever needed, or program their routes to where they meet up with refuse trucks on the right frequency." The Citymaster's power is provided by a 24 hp, 3-cylinder Lombardini diesel engine that is Euro 2 compliant (doesn't require Euro 3 compliance). There are twin poly brooms in front, which extend during use. "Primarily, the machine is used to clean pathways, walkways, and shopping precincts, mostly for municipal applications," said Steve. "We've sold a lot to shopping centers, as well, and big carparks and sports stadiums. At the stadiums, they use it to clean the whole facility. It's big enough to do the job, but small enough to get in and around the concrete structures both inside and out." Debris is moved through an 8-inch intake tube and up into an area about 3-foot square, which slows the debris down enough to drop through a screen into the plastic 'hopper.' "The intake tube seldom, if ever, clogs," said Steve, "because if it's going to get stuck then it's typically too big to get into the tube in the first place. The suction mouth is a foot wide, and then narrows down to the 8" tube. "If there's an item that might get stuck, for example a pizza box, then it won't pick it up in the first place. At any time, the driver can get out and grab something that won't fit and just place it by hand into the wheelie bin hopper. If he wants to do that, all he has to do is drop the wheelie bin down from its base, lift the top and put the material in. Because the sweeping part of the vehicle is actually a trailer that's hinged off the back portion of the driver's area, the Citymaster appears to be extremely maneuverable. I talked to a council representative who enthused about their Hako, remarking that one of its most positive features was a turning radius that allowed it to go most anyplace. "The two-piece chassis is hydraulically pivoted, and a ram controls the steering. It was designed to be extraordinarily maneuverable. Where the front part goes, the back part will definitely follow. Even if you get into someplace where you have to back out, it's no problem to do so. 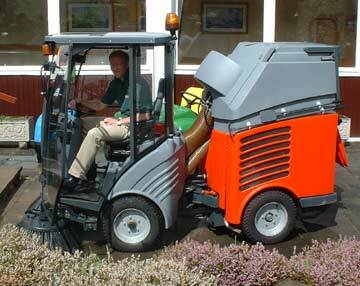 "The sweeper has a filtration system that cleans the air of any dust that's in the airflow. The filters are easy to access by unhinging the top of the machine at the back. Then, the filter platform hinges down to allow for easy cleaning. The filters need to be washed, typically, only once per day. 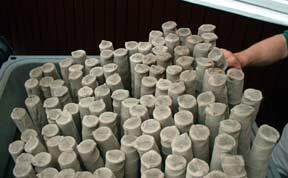 The filters are made from a very durable, waterproof material. "There is also a water system on the Citymaster. This puts a water spray down onto each brush, and into the top of the intake tube. That suppresses the vast majority of dust." The Hako Citymaster 300 has been available for about 2-1/2 years, and appears to be capturing its own niche in the English marketplace. According to Steve, it's taking business from larger sweepers as well as smaller ones, making it an entrant into what Steve called "one of the only growing segments of the market." As far as other equipment I've seen, the Citymaster 300 offers a maneuverability and design unknown in the American marketplace. It will be interesting to see if this type of design makes it across the Atlantic any time in the near future. Coming next, are the results of my informal interviews with attendees of the tradeshow, who are called 'members of council,' the counterparts of our U.S. public works managers. I asked them what they considered to be the important factors in evaluating the sweeping equipment they use in the Scotland marketplace.